Matcha (抹茶, Japanese: [mat.tɕa], English /ˈmætʃə/ or /ˈmɑːtʃə/[i]) is finely ground powder of specially grown and processed green tea leaves. It is special in two aspects of farming and processing: the green tea plants for matcha are shade-grown for three to four weeks before harvest, with the stems and veins removed during processing. During shaded growth, the plant Camellia sinensis produces more theanine and caffeine. The powdered form of matcha is consumed differently from tea leaves or tea bags, and is suspended in a liquid, typically water or milk. The traditional Japanese tea ceremony centers on the preparation, serving, and drinking of matcha as hot tea and embodies a meditative spiritual style. In modern times, matcha has also come to be used to flavor and dye foods such as mochi and soba noodles, green tea ice cream, matcha lattes, and a variety of Japanese wagashi confectionery. Matcha used in ceremonies is referred to as ceremonial-grade matcha, meaning that the matcha powder is of a high enough quality to be used in the tea ceremony. Lower quality matcha is referred to as culinary-grade matcha, but there is no standard industry definition or requirements for either. Blends of matcha are given poetic names known as chamei ("tea names") either by the producing plantation, shop, or creator of the blend, or by the grand master of a particular tea tradition. When a blend is named by the grand master of a tea ceremony lineage, it becomes known as the master's konomi. Matcha is made from shade-grown tea leaves that also are used to make gyokuro. The preparation of matcha starts several weeks before harvest and may last up to 20 days, when the tea bushes are covered to prevent direct sunlight. [better source needed] This slows down growth, stimulates an increase in chlorophyll levels, turns the leaves a darker shade of green, and causes the production of amino acids, in particular theanine. Only the finest tea buds are hand-picked. After harvesting, if the leaves are rolled up before drying as in the production of sencha, the result will be gyokuro (jade dew) tea. If the leaves are laid out flat to dry, however, they will crumble somewhat and become known as tencha (碾茶). Then, tencha may be de-veined, de-stemmed, and stone-ground to the fine, bright green, talc-like powder known as matcha. Ceremonial grade: This is the highest quality used mainly in tea ceremonies and Buddhist temples. This is stone-ground into a powder by granite stone mills. It is high-quality and expensive (around US$100–140 for 100 g). The unschooled drinker is unlikely to notice a large difference between Ceremonial and Premium grade. Ceremonial is characterized by subtle tones of "umami". Premium grade: High-quality matcha green tea that contains the full nutritional content and uses tea leaves from the top of the tea plant. Price point (~$50–80 for 100 g). Best for daily consumption and contains the full range of antioxidants, vitamins and minerals. Is characterized by a fresh, subtle flavour. Usually perfect for both new and everyday matcha drinkers alike. Cooking/culinary grade: Cheapest of all (~$15–40 for 100 g). Suitable for cooking purposes. Slightly bitter due to using leaves lower down on the green tea plant. In general, matcha is expensive compared to other forms of tea, although its price depends on its quality. Grades of matcha are defined by many factors. Where leaves destined for tencha are picked on the tea bush (Camellia sinensis) is vital. The very top should have developing leaves that are soft and supple. This gives a finer texture to higher grades of matcha. More-developed leaves are harder, giving lower grades a sandy texture. The better flavour is a result of the plant sending the majority of its nutrients to the growing leaves. Without the correct equipment and technique, matcha can become "burnt" and suffer degraded quality. Typically in Japan, matcha is stone-ground to a fine powder through the use of specially designed granite stone mills. Oxidation is also a factor in determining grade. Matcha exposed to oxygen may easily become compromised. Oxidized matcha has a distinctive hay-like smell and a dull brownish-green colour. There are two main ways of preparing matcha: thin (薄茶, usucha) and the less common thick (濃茶, koicha). If the sieved matcha is to be served at a Japanese tea ceremony, then it will be placed into a small tea caddy known as a chaki. Otherwise, it can be scooped directly from the sieve into a tea bowl. Koicha, or thick tea, requires significantly more matcha (usually about doubling the powder and halving the water): about 3.75 grams (amounting to 3 heaping chashaku scoops, or about one teaspoon) of matcha and approximately 40 ml (1.3 fl oz) of hot water per serving, or as many as 6 teaspoons to ​3⁄4 cup of water. Because the resulting mixture is significantly thicker (with a similar consistency to liquid honey), blending it requires a slower, stirring motion that does not produce foam. Koicha is normally made with more expensive matcha from older tea trees (exceeding thirty years) and, thus, produces a milder and sweeter tea than usucha; it is served almost exclusively as part of Japanese tea ceremonies. 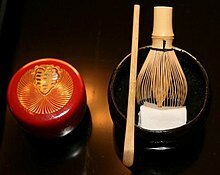 A bamboo spoon to measure the powder tea into the tea bowl. Not the same as a Western teaspoon. ^ "Matcha", also called fine powder tea or powdered tea, is the most common spelling, and accords with Hepburn romanization of the hiragana まっちゃ. In Kunrei-shiki romanization (ISO 3602) it is "mattya". "Maccha" is a nonstandard and uncommon spelling. ^ "matcha - Definition of matcha in English by Oxford Dictionaries". Oxford Dictionaries - English. Archived from the original on 4 September 2017. Retrieved 9 September 2017. ^ a b Tsutsui Hiroichi, "Tea-drinking Customs in Japan", paper in Seminar Papers: The 4th International Tea Culture Festival. Korean Tea Culture Association, 1996. ^ "thezensite: The Origins of Buddhist Monastic Codes in China; book review". thezensite. Archived from the original on 23 February 2009. Retrieved 11 March 2009. ^ "A Matcha Highlight Part One: Harvesting Grade A Matcha". 1 June 2012. Archived from the original on 9 September 2017. Retrieved 9 September 2017. ^ "How Matcha is Processed". Ippodo Tea. Archived from the original on 8 April 2012. Retrieved 19 September 2012. ^ "How Matcha Green Tea is Produced". www.breakawaymatcha.com. Archived from the original on 10 September 2017. Retrieved 9 September 2017. ^ Kaneko, Shu; Kumazawa, Kenji; Masuda, Hideki; Henze, Andrea; Hofmann, Thomas (March 2006). "Molecular and Sensory Studies on the Umami Taste of Japanese Green Tea". J. Agric. Food Chem. 54 (7): 2688–2694. doi:10.1021/jf0525232. PMID 16569062. ^ "Aiya's Blog - The Different Grades of Matcha (and Their Characteristics)". www.aiya-america.com. Retrieved 9 September 2017. ^ a b "Growing and Processing of Matcha". Marukyu-Koyamaen. Archived from the original on 30 April 2016. Retrieved 18 April 2016. ^ "Preparation of Matcha". Marukyu-Koyamaen. Archived from the original on 2 November 2011. Retrieved 7 November 2011. ^ Hosking, Richard (1997). "Wagashi". A Dictionary of Japanese Food. Tuttle Publishing. p. 168. ^ "Matcha Green Tea Smoothie". Living Fresh Daily Recipes. 7 March 2018. Archived from the original on 5 July 2018. Retrieved 4 July 2018.